Israel carried out airstrikes in the Gaza Strip on Monday after dozens of rockets were fired from the Palestinian territory into Israel. Clashes which erupted during an Israeli special forces operation in Gaza late Sunday had threatened to derail efforts to restore calm to the Palestinian enclave after months of unrest. At least two Palestinians were killed in Gaza on Monday. Seven were killed in the overnight clashes, one of whom was a local commander for Hamas's armed wing. One Israeli army officer was also killed. At least six Israelis were injured later on Monday when dozens of rockets were fired from Gaza. Prime Minister Benjamin Netanyahu cut short a trip to Paris to commemorate the end of World War I to rush home as tensions rose. Israel stressed its Sunday operation was an intelligence-gathering mission and "not an assassination or abduction." The statement from Israeli military spokesman Ronen Manelis signalled that the mission did not go as planned and resulted in the clash, which Palestinian security sources said included Israeli air strikes. 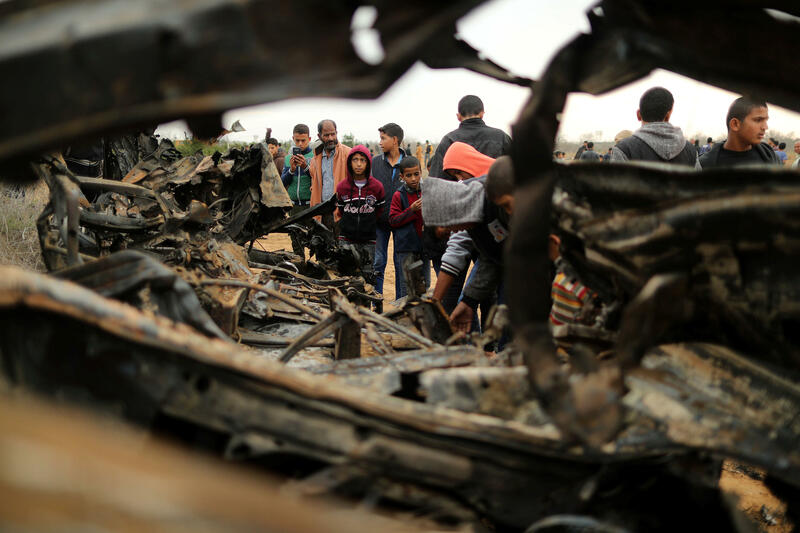 Hamas, the Islamist movement that runs the blockaded enclave, and its armed wing, spoke of a "cowardly Israeli attack" and an "assassination", vowing revenge. Hamas's armed wing said an Israeli special forces team had infiltrated near Khan Yunis in the southern Gaza Strip in a civilian car. Israeli air strikes followed when the operation failed, it said in a statement. Israel's military had not confirmed those details. Gaza's health ministry said seven Palestinians were killed. Five others were also Al-Qassam members, while the seventh was a member of a separate militant alliance known as the Popular Resistance Committees, according to Gazan security sources. Israel's army confirmed one of its officers was killed and another was injured. "At this incident, an IDF officer was killed and an additional officer was moderately injured," it added, referring to the Israel Defense Forces and identifying the officer only by his rank, lieutenant colonel, and the first letter of his name, M.
Netanyahu, who had been attending World War I commemorations in Paris, arrived back home on Monday and was to convene a meeting of security chiefs. The clash comes after months of deadly unrest along the Gaza-Israel border, which had appeared to be calming. Recent weeks have seen Israel allow Qatar to provide the Gaza Strip with millions of dollars in aid for salaries as well as fuel to help ease an electricity crisis. Defense Minister Avigdor Lieberman said he had opposed transferring the money to Hamas. What's behind the deadly clashes in Gaza? At least 227 Palestinians have since been killed by Israeli fire, the majority shot during protests and clashes, while others died in tank fire or air strikes. Egyptian and UN officials have been mediating between Israel and Hamas in efforts to reach a long-term truce deal. A total of $90 million is to be distributed in six monthly installments, Gaza authorities said, primarily to cover salaries of officials working for Hamas.